For my last science travel outing of the year, I went to the Grant Museum of Zoology, during lunch break of my last work day of 2014. 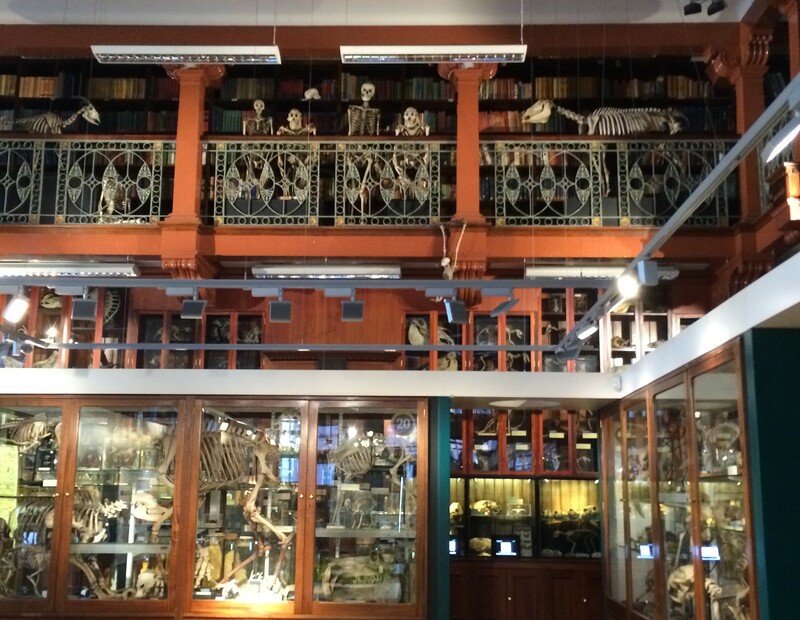 The Grant Museum of Zoology is a natural history museum of University College London. As a university museum, it’s not very big – only spanning one room – but there is a lot to see. It has samples from 67,000 species, including one of only seven existing quagga skeletons in the world. 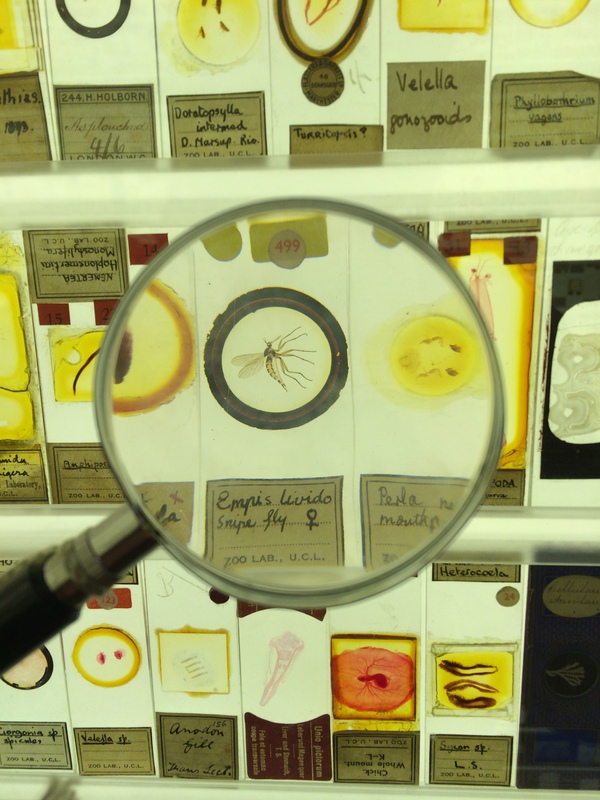 Elsewhere, there’s a little alcove that’s covered floor to (mirrored) ceiling in old microscope slides, which you can take a closer look at with the provided magnifying glass. It made me feel like a 19th century biologist! The museum was founded in 1828 as a teaching museum, so some of the specimens were prepared for educational purposes, which can make them a bit creepy-looking. 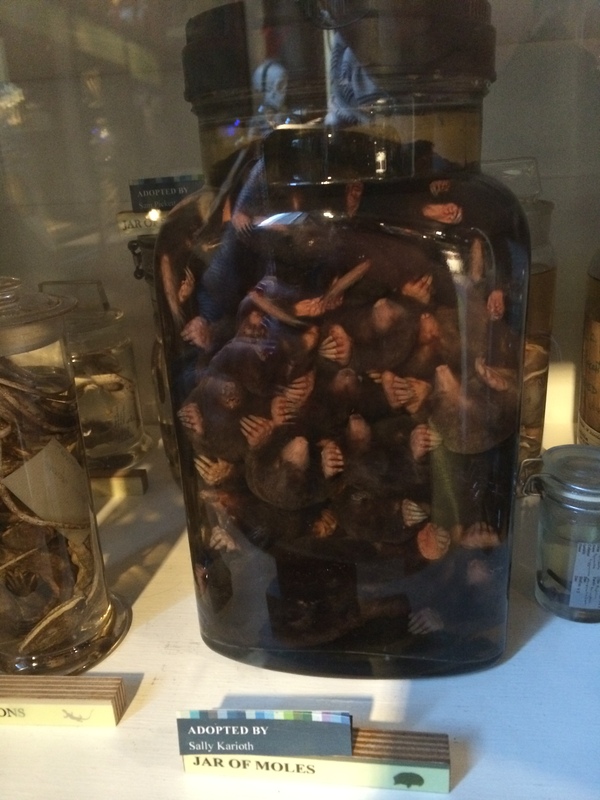 Monkey heads in jars, that sort of thing. Today, the museum still has an educational purpose. It’s the only zoological university museum in London, and offers teaching support to university groups at UCL and beyond, who want to use the samples in the classroom, as well as to high school, artists, film crews, and others in need of animal anatomy samples. The museum is currently working on continued preservation of some of its largest skeletons as part of the “Bone Idols” project. When I visited, the rhino was being worked on. To be able to carry out this preservation task, as well as its regular maintenance, the Grant Museum is raising funds in several ways. 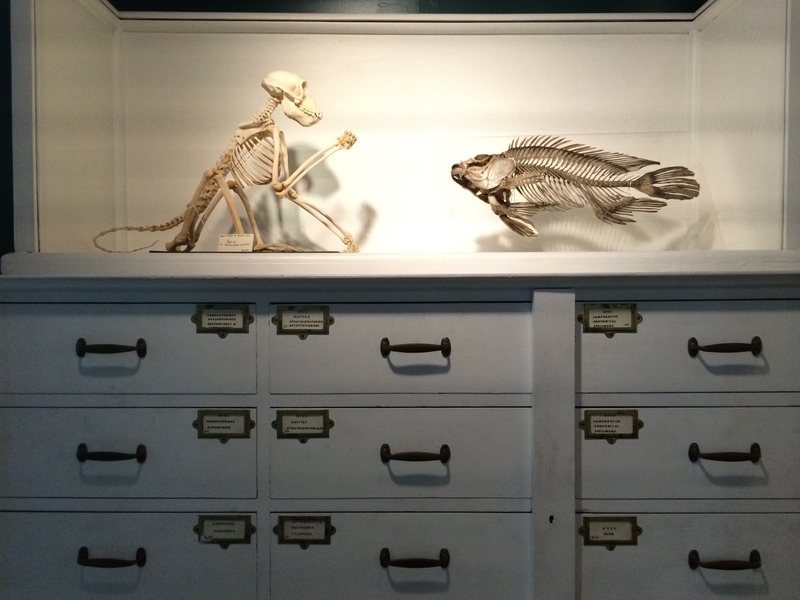 The most visible is the “adopt-a-specimen” project, which allows you to have your name displayed next to one of the jars or skeletons, in return for a donation. Recently, my friend Kat (who lives in Canada) received this specimen adoption as a birthday present from her other London-based friend, so I set out to find her jar. I knew it was an octopus, so that narrowed it down somewhat, but it still took me a while to find the cephalopod section. When I did, I had to search a bit among all the other adopted samples, but then I saw it, at the back! 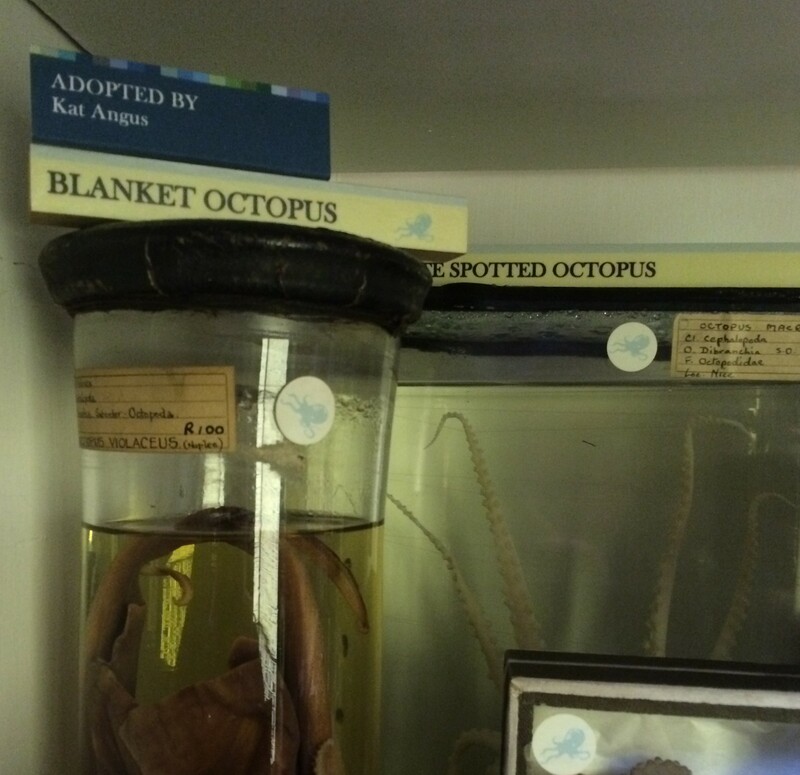 If you also want your name on an animal of your choice, you can adopt a specimen via the Grant Museum website. Let me know if you do, and I’ll drop by again to visit it. The museum is a stone’s throw from my office and I can’t believe I had never even been before last week!